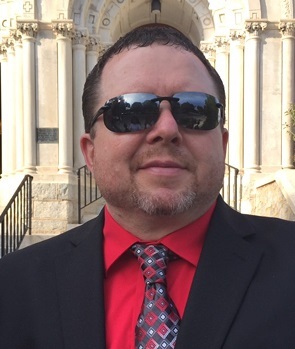 Thomas Christopher Skinner, 46, of the Kansas City Northland, passed away peacefully on January 17, 2019, at his home with family at his side. Visitation will begin at 9:30 am, followed by a service celebrating Chris's life at 11:00 am, on Saturday, January 26, at Park Lawn Northland Chapel, I-35 at State Route 291, Liberty. Burial will follow in Resurrection Cemetery. In lieu of flowers, memorials are suggested to a fund which will be used for his children's education at https://www.gofundme.com/chris-skinner039s-seize-the-days-fund/donate. Chris was born March 19, 1972, in Fort Gordon, GA. He was a Technical Service Representative at Tnemec Company, where he served for 20 years. Chris leaves his wife, Deborah; children, Johnathan Skinner, Emma Skinner, Kendra Carlson (Anthony) and Christopher Wells (Lizzie); grandchildren, Ellie, Payton and Jordyn. He is also survived by his parents, Rhonda Sue Kelly, Johnny Brown (Lori) and Sue "Mama Sue" Brown; grandfather, Thomas Edward Skinner (Norma); siblings, Vanessa Kelly, Angie Kelly, Sanja Lyon (Carleton), Tanya Farrell (Greg) and Cory Brown (Andi), as well as numerous nieces, nephews, aunts, uncles, cousins, and many friends. He will be greatly missed by all. Visitation will begin at 9:30 am, followed by a service celebrating Chris’s life at 11:00 am, on Saturday, January 26, at Park Lawn Northland Chapel, I-35 at State Route 291, Liberty. Burial will follow in Resurrection Cemetery. I knew of Chris at work but did not work directly with him until a year and half ago. Chris quickly became a friend and confidant. A great man, friend, co-worker, husband and father. He was so very proud of all of his kids. He will be missed by so many. Thank you Chris, I am a better person for knowing you. God Bless You! We love y'all. Thoughts and prayers are with y'all. My sweet little brother, there will always be a hole in my heart since you left us. My first love, I'll love you forever and ever! There will never be enough words to describe what a magnificent person you were. A big piece of my heart went with you and you will be greatly missed. I love you bubba. I will always remember Chris; his great smile, kindness......and his singing!! Always up and positive. One very fine fellow. We are so sorry for the lost of Chris. Our thoughts and prayers are with you all at this time. May God give you peace and comfort knowing Chris is in his new home now and all his pain and suffering is gone. Hold his memories in your hearts and he will always be with you. May God bless you all. Chris, We have always loved you and your beautiful family. You are missed and will always have our love. It’s been years when I saw Chris last , He was in his twenties.He came into Zaxby’s and we hugged, talked and laughed together.I’ll remember him always as sweet, loving, curly head, and always smiling young man. You will Be Missed Chris.❤️ To your Wife,Children,Mother,Grandparents,Aunts,Uncles Cousins and everyone that loved you.I pray that as the day passes Lord Your healing touch will comfort and succor them in this time of distress and may this be a thing that causes each of them today to draw closer to You, knowing that You alone can heal the broken - hearted and bring joy out of pain. Love and Prayers to all my Family. Where to begin... Chris will always hold a special place in my heart. I was an employee of Chris’s for almost 3 years. Chris was always upbeat and in a good mood. I didn’t look at him as boss because he genuinely cared me. He became a friend and someone I looked up to. My dad was diagnosed with bone cancer and was sick for almost 2 years before he past away. Throughout the whole process Chris made it a point each day to talk to me to see how I was doing. Chris cared about me and helped me through a rough part of my life after my dad passed away. I think this story perfectly summed up what kind of person Chris was. He showed compassion and a unique way of going about life! He will truly be missed, but please take comfort in knowing what a great human being he was. I’m privileged to have gotten the chance to know him and call him a friend. We are so sorry about the loss to your family and have been keeping you in our thoughts and prayers. Clearly, Chris made some lasting memories with many people and those stories and his kind actions will be paid forward. Chris was a unique soul. He loved his work, appreciated his staff and loved his family. I was fortunate in that Chris and I got to talk almost daily. He shared with me many stories of his childhood and though I have never met his Mom, Aunts, or his PaPa through his stories it is if I have known you my entire life. Chris also had his Missouri family which included his brother, sisters, and Dad which he was so proud of and equally loved. To his wife Deb and his 4 children Chris loved and cherished so much the family he made with each of you. My time with Chris made me a better person, father and husband. His spirit will always live in all of us that got the opportunity to know and be around him. I will miss our time and talks. Chris will truly be missed by the crew he led at Tnemec. Upon joining this fantastic crew, it was with open arms by him to help, lead, and respect those who depended on his leadership. Professionalism was always his Motto and it was clearly expressed everyday to those he led. Just know Brother, this really hurts and I trust your legacy will live on through all of us. I first want to express my deepest condolences to Deborah and Family for your loss and thank you for the opportunity to say a few words. I know this to be true in life, that God puts people in your life to direct, instruct and inspire you in your life, so you can become a better person. In 2006 God allowed me to meet a man that did just that in my life. A man that took a chance, a man that saw a raw, wondering, and checkered past young man and took it upon himself to embrace, mentor and not give up on him. Thirteen years ago I was that young man and that man I met, his name was Chris Skinner. Quick story, one day I was working on my truck, changing the breaks and due to my inexperience I got to a point where I did not know what to do. I am sitting there on my drive way and I am telling myself, “ok, what do I do know”. I remembered that Chris said to me one day, “If you ever need anything or you just want to talk, give me a call, so I did! I explained and he said, “I‘ll be right there and we will do it together”. He came over and we got the brakes changed. We talked for a little while and majority or the time people talk about what they are passionate about , what they love, what is more important to them and do you know what we talked about, God, Family and work! I mentioned earlier about God putting people in your life to help you along the way. Well those 3 subjects we talked about God, Family and work, slowly but surely were the 3 things that have shaped my life to this day. I thank God for Chris Skinner, for his morals and values to be rubbed off on me. Even though he is no longer in our presence, but I, WE should take on the challenge to continue to live out who he was in our lives. Again my deepest condolences, I will continue to pray for you Deborah and your families, along with the rest of the family, May God continue to bless you in the days to come. My loving son, my friend, my soul, I will miss you till the end of my days. A mother should never have to bury their child. It should have been me. I was supposed to go first. My first born, you took a piece of my heart with you. I will never be the same without you. My beautiful boy, no loss has ever hurt like this. This is not the end, I will see you again. To my one and only son. You are the best son a mother could ever have. My heart is broken and will never heal. I love you as much today as I did the first time I ever saw that beautiful face. I have lost a son, a friend and my confidante. I will for the rest of my life, mourn your loss. Good bye my love, until we meet again.